Pressed Juices digest cleanse is designed to give your digestive system a break whilst filling the body’s cells with necessary nutrients to improve overall gut health. Often one can feel tired, sluggish and bloated which all correlates from within the digestive system. Living in a fast paced world it is easy to over consume “fast foods” such as refined carbohydrates, sugars, processed foods and additives to which can increase inflammation resulting in the above symptoms. Our stomach deserves to take a break and need time to heal. The digest cleanse contains a variety of produce that focus on optimal digestive health by helping to create correct gastric secretion which enables food breakdown, healing the digestive track lining by soothing inflammation and helping to create a calming environment in your gut. By focusing interests on certain ingredients, which preform a range of beneficial influences, this cleanse is one of the most popular to participate in. A digestive cleanse enables your digestive system to rest, reset and mainly relieve any discomfort you may be experiencing. The ingredients selected assist by reducing gasses, decrease bloating, increase nutrient absorption and focus on achieving optimal digestion. Through eliminating the above digestive discomforts your body will reduce other areas of concerns such as problematic skin; toxins begin to build up through the gut can begin to break through surfaces on the skin. 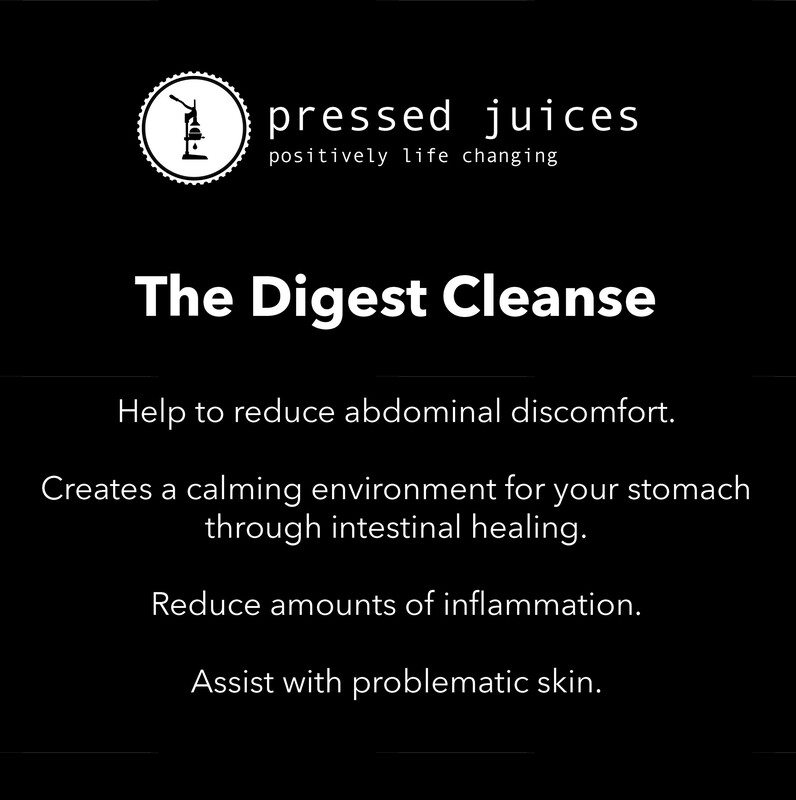 The digest cleanse will help to reset yourself to get looking/ feeling amazing and light without abdominal discomfort. Leading up to this cleanse it is advised to begin reducing acidic foods such as refined sugars and foods that are high in saturated fat to begin the healing process. During your digestive cleanse you are welcome to snack on raw nuts such as almonds or brazil nuts as these will help increase your fiber intake.